Last night, the Moon passed the bright Pleiades star cluster. Tonight the Moon passes yet another close bright star cluster, the Hyades. Both clusters are located in Taurus and though both are very close to Earth (for a cluster), they are not related. In the chart below last night’s cluster, the Pleiades is the tight ‘dipper’-looking group of stars near the upper right part of the chart. 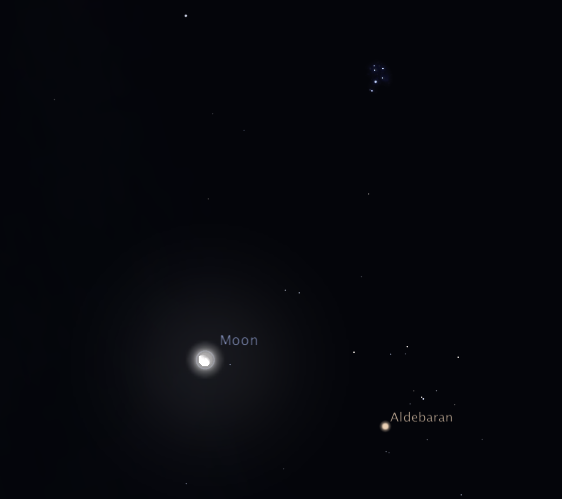 Tonight’s Hyades cluster looks like a ‘V’ on its side (opening to the left) and is located just to the right of the Moon. This cluster is closer to us than the Pleiades (151 light-years vs 440 light-years) and older (625 million years vs 100 million years). In Greek mythology, the Pleiades were the ‘Seven Sisters’. The Hyades have a similar back story and represent 5 sisters. After the death of their brother, Hyas (hence Hyades), the sisters continually wept and the appearance of the cluster in the sky was associated with rain. The brightest star among the group is not actually a member of the cluster. Aldebaran is the 13th brightest star in the sky and is actually located only 65 light-years from Earth, less than half the distance to the Hyades. It is a mere coincidence that the star and the cluster are located along the same line of sight. Aldebaran is a K5 orange giant star 1.7 times more massive than the Sun and 44 times larger than the Sun. It is an average magnitude of +0.9 but similar to most evolved red giant stars it’s brightness can change by a few tens of percent. Tomorrow – Day 22 – The Moon revisits the site of a 956 year old explosion.